So, a customer called to report another no interactive network license available problem. We quickly narrowed it down to a problem with the license server: it wouldn’t start. Start Server said “Server started successfully”, but Perform Status Enquiry said FLEXnet Licensing error:-15,570. Everything about the license file checked out ok: it had the right MAC address, it had the right computer name, it had the right license features. But still the server wouldn’t start. I was already WebEx’d into the customer’s computer, so I downloaded Process Monitor and used it to track what LMTOOLS was doing when I clicked Start Server. 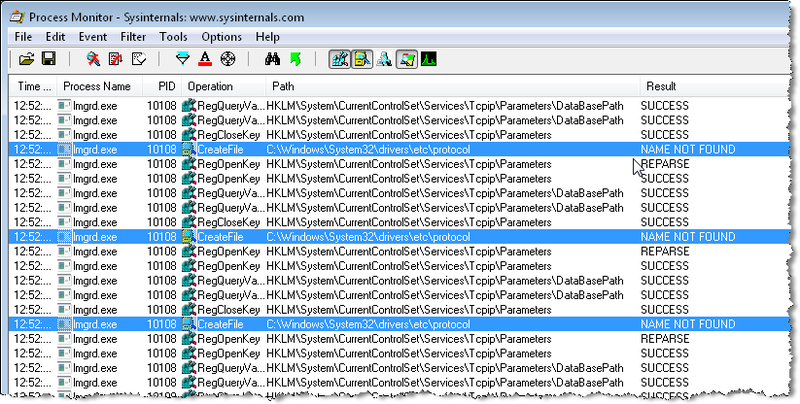 When you click Start Server, lmtools.exe starts the service lmgrd.exe, so I filtered for all Processes that started with “lm”. To check whether LMTOOLS eventually did find the protocol file, I right-clicked “C:\windows\system32\drivers\etc\protocol” and clicked Include, to include only the log entries for the protocol file. And sure enough, the protocol file was never found. So I copied over the protocol file from my system, and then I was able to start the license server. (lmgrd) Failed to open any default TCP port. This entry was posted in Licensing, Network by xsisupport. Bookmark the permalink.